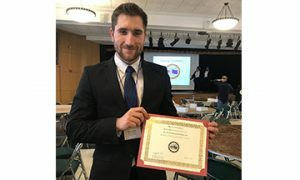 During the EuroSim 2019 international inter-university simulation of the European Union that took place in the USA at St. John Fischer College in Rochester, NY between 28-31 March 2019, the FASoS team brought one of the 5 awards home. Congratulations to Dominik Schmidt, second year European Studies Bachelor student, who was awarded best delegate at EuroSim 2019 for his alter-ego role. Dominik represented German Minister Michael Roth, member of the Social Democratic Party of Germany (SPD), in the General Affairs Council. EuroSim 2019 is coordinated at FASoS by Dr. Dorina Baltag and is organised annually by the Transatlantic Consortium for European Union Studies and Simulations (TACEUSS).